Planning for a community event is never straightforward, never mind the actual implementation. Yet truth be known, it’s not the actual organizing that is at times paralyzing, rather it’s the self-doubt. Fear it won’t work, concern that people won’t attend, not to mention the realities of conflicting events, miscommunication, lack of availability of food for the BBQ, last minute changes to the schedule, and the flurry of getting supplies last minute. Adding insult to injury is the stress of do we have enough food or do we have too much? Yet underneath these tangible stresses is the nagging question does this matter, or more importantly, does this really matter to the community? This is resonating question when working in a community not your own, when situations are out of your control, and you feel a lot is riding on a particular event. Moreover, as a guest in a community navigating an event can be made difficult by way of not knowing simply because you can’t know unless you are from there and since you aren’t from there, you likely will never know. The event hasn’t even started and I am tired and exhausted. Show time. Crowds start to dwindle in, I count 25 – a good turn out until I remember the number of people we purchased food for. I start to introduce the event. As an outsider so wrapped up in thinking about all the things that need to be done, I may have misread the crowd – should we have wait for more people to arrive before introducing the evening’s topic or were those present patiently waiting to eat? Next is an introduction of the facilitators, cooks, followed by a quick welcome. Thoughtful contributions from the E.D. who sees how this project is integral to other projects taking place in the community and trying to vie for community members’ time. The E.D. gets it, but will he inspire people to move among the three stations that ask about health and well-being in the context of a mine? Dinner is ready. The blessing is given in the traditional language of the region. This grounds me – reminds me of why I am here, why we are all here. More people trickle in. Some serve themselves to a hamburger and the wonderful salads handmade by the kitchen help. Some members have moved towards the stations ready to contribute comments. Flitting from station to station, I listen to people talk about impacts of mining to their community. People talk about the need for jobs and the need for more local training while in the same breathe raising issues of addiction and racism that are aggravated with the influx of people that come with a mine development. Resource development is a complex issue, particularly in communities where opportunities to earn an income and support one’s family are never straightforward. I stop at a station to watch one of the guest facilitators working with a community member. Another member comes forward and we engage in conversation. I am in awe of the sharing and patience of this community who over the evening shared their thoughts and experiences with mining past and present while waiting for the future to present yet another short-term opportunity. The questions asked this evening have been asked before, and no doubt they will be asked again. The answers provided by community members are more than likely the same – help us with our youth, we need jobs, and our community struggles with losing its language. As I go station to station and see the outcome of the generosity of those present, I am reminded of why indeed I do this work. I am so fortunate to be invited into a community, to share a meal, and a laugh with members who don’t know me or who are just meeting me for the first time, who maybe tired of people coming into their community and asking questions and leaving. Young children run around laughing, the data collection stations are filled with people listening, talking or supporting one another. People line up for seconds of dinner or fill plates for family members at home. Many return to a table to sit and talk. There is no wild rush to the door to leave; the long lines of tables are not empty; we did not run out of food; and the sheets of paper on the wall are not blank. Tonight I was told about an Elder who, during an exercise of Fish and Boulders, said that boulders are important too. Boulders are not just barriers, as described in the exercise at a particular station. Rather boulders are places of birth, newness and opportunity. Salmon find refuge behind boulders or among boulders to spawn. His comment makes me pause. All the boulders I thought I faced in planning tonight’s event were just that, an opportunity to see something new. On my list of expected outcomes I did not include such a thoughtful gift. 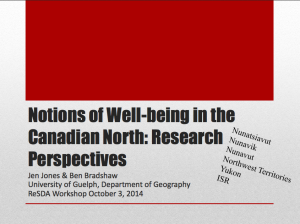 This is a link to a presentation Ben Bradshaw and I made to folks attending the 4th Annual ReSDA meeting Oct 2014 in Happy Valley Goose Bay, Labrador.